Saturday February 26, 2011 students of NSO’s Community Action Association (CAA) left their lives in Providence, Rhode Island to spend spring break in Guatemala. Our journey began at 2:30 in the morning when we all piled into a Johnson & Wales bus headed for the Logan airport in Boston. The 14 participants spanned from freshman to senior and represented various majors from graphic design to baking and pastry. CAA members, Blair Schaefer and Brandon Lynch took on the responsibility of student advisors. They managed our pre-trip meetings, group supervision during the trip and worked closely with Erin McCauley of the Feinstein Community Service Center for the months of preparation that went into the trip. Blair and Brendan are juniors that decided to take this leadership role after going on the San Diego/Mexican Border trip in 2010 through CAA. Staff advisors for the trip were associate professors Mehdi Moutahir and Diane McCrohan from the College of Business and Susan Connery, Director of the Feinstein Community Service Center. NSO has worked previously with Via International (formerly Los Niños) on several alternative spring break programs including San Diego and Tijuana, Mexico. Via organizes community development programs for over 600 college and high students each year. They offer volunteer opportunities in Mexico, Guatemala, California and New Mexico along the border. Programs in Guatemala are amongst the newest offerings and seemed like a great new opportunity for CAA. 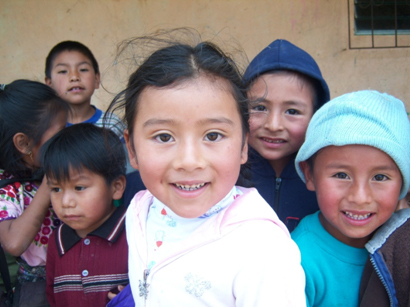 The underdeveloped country of Guatemala is home to more than 13 million people that are living on an average annual income of $227. Many of the students had never left the United States, so excitement was closely accompanied by anxiety as the group landed at the Aurora international airport in Guatemala. A bus picked us up and drove us directly to the village of La Union where we would be helping out for the week. As we drove along the dirt road we pulled up to a rundown school yard where dozens of smiling school children ran to greet us at the door of our bus. They were like a swarm of little paparazzi without cameras as they escorted us to a make shift stage where they greeted us with a traditional Guatemalan welcoming ceremony. A few of the elementary students took the stage wearing vibrant hand woven garments as they performed their customary prayer and dance. La Union was so grateful for our arrival it quickly became an honor to get to work with such a community. We woke up early Sunday morning to explore the local market in San Martin where our hotel was located. There are more venders out on Sundays than any other day of the week, it seemed as though all of San Martin was out. Hundreds of stands surrounded the town’s church, selling everything from colorful tapestries to live rabbits. Around every corner there was a new aroma, both good and bad, freshly made soups followed by mounds of dried fish and other seafood. After an hour at the market we got on our faithful bus to La Union for our first day of work at the school. A dilapidated soccer field separated two school buildings where the elementary through early teens were taught. One of the school buildings had a gated yard that would flood over during the rainy season and fill the classrooms with mud. Our job for the week was to fill in that area with cement and to paint both of their school buildings inside and out. We did not have the luxury of heavy machinery to accomplish our tasks, so we feverishly went to work that day with shovels, wheelbarrows and our hands to dig up a flat surface that would ultimately be replaced with cement. As we completed our first day of hard work, we all congregated in one of the classrooms and a man from the village named Bernardino educated us on the civil war in Guatemala and what he experienced during the war. From roughly 1960 to 1996 the indigenous Mayans were repressed by the Guatemalan government. It was reported there were over 40 thousand disappearances and hundreds of thousands were killed. Bernardino told us of the military brutality that many of his people witnessed, which was simply too graphic to include. He later found out that the weaponry that armed these merciless solders was actually supplied by the United States. The American government’s intent was to protect the Guatemalans from communist invasion; however their military had different plans for the use of this power. To this day, the native Guatemalans continue to fear retribution and are forced to live in silence as if the events had never happened. For Bernardino to even talk to us was a risk, but one that he believes is worth taking to raise awareness of what really took place and to insure that it is not erased from the textbooks or people’s memories. As the day came to a close, we were treated to a wonderful meal cooked by a local chef named Christy who has experience with American cooking. She came to America when she was just a girl as an exchange student and actually married the son of her host family and he now lives with her in La Union. Breakfast, lunch and dinner were catered by Christy the whole week; she would take customary Guatemalan meals and cook them with an American twist. In the past she has found that many outsiders aren’t able to stomach the local spices that Guatemalans use without suffering unpleasant consequences. Christy’s delicious beans, meats and veggies fueled us through the next three days and gave us the energy to do more cementing and painting than we had even planned. In the course of this time we not only did great work for the school, but we explored further to see all that the beautiful country of Guatemala has to offer. One morning we visited a school within San Martin that was specifically for children with special needs. The kids at this lively little school were so incredibly sociable and friendly it felt as if we already knew one another. One young boy named Luis, otherwise known as “Wicho”, immediately ran up to us wanting to try out our cameras. Initially everyone was hesitant to hand theirs over, but we were forced to eat our own words after finding out what an impressive little photographer Wicho was. He confidently sat us all down, snagged himself a pair of sunglasses from group leader Brandon, and continued to pose with anyone that had a free lap to sit on. We hung around with Wicho and the other charismatic youngsters playing basketball, socializing and of course taking many unforgettable pictures. On day four of our trip we drove to Mixco Veijo, the mountaintop location of a ruined Mayan city. This location was specifically chosen by the Mayans for defense purposes. Given its role was to keep invaders away, the drive to the top was not going to be easy. The dirt road hugged the edge of the mountain face and apprehensively held two-way traffic. I was reminded of what our translator and good friend Gerson told me earlier in the week how Guatemalans believe that “if you can drive in Guatemala, you can drive anywhere in the world”. After that ride, I became a believer. Needless to say we made it in an unproblematic fashion and the bus driver never even had to rely on the three strands of barbed wire (guardrail) for support. The view at the top was well worth the ride, and the Mayan ruins were icing on the cake. The ruins were built in the 12th Century and looked as if they were made that morning just for us to see. Our tour guide brought them to life by pointing out their places of worship, offering sites, and courts where the Mesoamerican ballgame was played. Our guide pointed out that he, a native Mayan still practices the traditional Mayan culture. When it came time to ask questions many of us had in mind the American misconception of 2012 and it supposedly marking the end of the world. If there is anyone qualified enough to bring clarity to this debate it would be the living Mayan standing in front of us. He grinned knowing the question was going to be asked and informed us that 2012 is simply the beginning of a new solar year. The Mayans actually believe that the beginning of a new solar calendar year brings happiness and peace. The mountaintop position of the ruins gave us a panoramic view of miles and miles of Guatemalan countryside. Not only did we get to see the countryside from its peak but later we would get to see what its soil is capable of producing. We went to a macadamia nut farm, coffee farm, and a vegetable farm that were almost, if not fully self sustainable using no heavy machinery. All three farms were visibly proud of their work and were eager to let us sample what they had harvested. The many volcanoes spread throughout Guatemala provide a one-of-a-kind harvest surface which presents a unique agricultural environment. The coffee above all, benefits from this growing environment and is graded the third highest quality in the world. Throughout the week, Guatemala’s rich personality became evident. What truly brought Guatemala to life was the time we spent outside of the urban areas, with the children and families of La Union. These families live in conditions that most American college students would consider extremely impoverished. We met one family of seven for instance that shared a hut no larger than the dorm room I am sitting in now. This family and all of La Union live in similar conditions but remain happy and extremely grateful for not only our help, but everything they have. Throughout the week we set aside time to reflect and discuss these diversities. During a reflection we recognized the importance of water to their community and how much work they have to put into obtaining it since the only working water pump in the village had broken. We consulted with the two Via representatives that had spent the week with us and found out that the cost for a new pump was very reasonable. Everyone eagerly contributed to what would amount to the price of one less souvenir. On our last day in La Union the villagers performed a goodbye ceremony for us. Following their presentation we surprised them the new pump. They were ecstatic to receive our gift and the parents went on to say that they will be eternally grateful for our gesture as modest as it may have seemed to us. If you happen to bump into anyone that was on the trip and ask them for the one thing they will remember most, do not expect to hear about the coffee tour, or even the Mayan ruins. My guess is they will tell you about the villagers and their admirable ways of living. During an evening reflection, Blair Schaefer simply explained it as “a sense of community togetherness”. The humble people of La Union find happiness through community and are not limited by poverty. I personally came on the trip as the assigned reporter and left with an appreciation for the simpler things in life. I realized how much I take for granted, while the Guatemalans celebrate life rather than sweating the small stuff.